65 A4 pages, packed tightly with information. 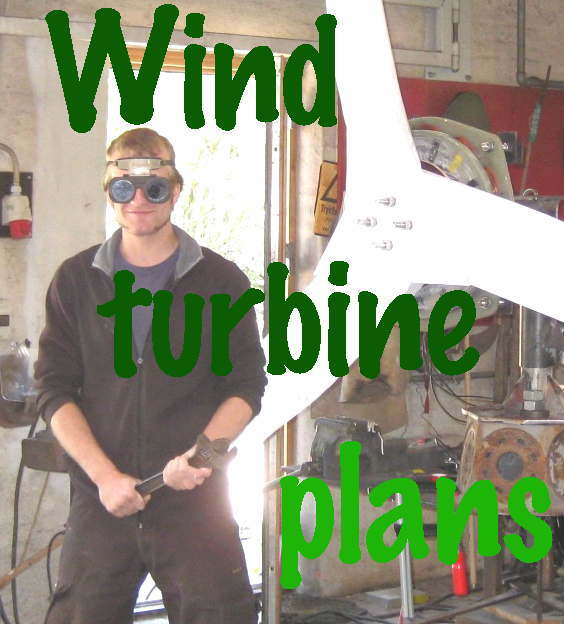 How to build 6 different sizes of wind turbine. How to carve the wooden blades, weld the frame and wind the coils for 12, 24 and 48 volt battery systems. Build your own alternator using powerful Neodymium magnets and generate useful amounts of electricity on a suitable site. The turbines furl automatically to protect themselves against high windspeeds. Hundreds of turbines have been built to these designs around the world. In fact an international association of user groups has been formed. The metric edition is the most popular, but North American readers would do well to get the American (Inches units) edition which features the magnets and wire that are obtainable in the USA and surrounding areas. If you are buying AWG wire, then use the American edition. Dimensions are in inches, and the magnets are 2″x1″x1/2″ size which is readily available there. You can buy this book (and my others) by following this link. “Mr Piggott has obviously been there and done that in the world of wind turbines and I found his book very useful in sorting out the uninformed sales nonsense from what could actually be achieved, particularly in terms of the amount or power you could expect to generate). I live on the edge of a very windy valley in north east Scotland and am very interested in using the wind to generate power for my cottage. The problem that I have is that from trawling the internet and have been bewildered by the range of windturbine products available and the staggering lack of available information on them. It is very difficult to evaluate the performance of each device from the manufacturers. Mr Piggott gives you the tools to evaluate performance for yourself. Perhaps more interestingly he gives good and hard and fast design instructions for building a range of wind turbines that are tried and tested designs. These wind turbines can be made for reasonable cost and with only skills that are relatively easily attainable (welding, winding wires, carving wood etc). But seriously if you want to get into wind power most efficiently this is the place to start. Perhaps a more important piece of information that Mr Piggott draws out is that if the AVERAGE wind speed is less than 5m/s at your location it really isn’t worth the time and effort of getting into wind power (the power in the wind goes up with the cube of the velocity so low speed winds dont have much available power to harvest). The annual average wind speed in Raleigh, North Carolina is 3.35 meters/second according to google. Is this not enough for a wind turbine? I was thinking about building one for our home. Sorry for taking so long but for some reason I do not get notifications of comments on this site. 3.35m/s mean windspeed is indeed very low. I do not recommend using wind for anything important. I do recommend using a very tall tower to try to catch some wind if you do. Solar PV is likely to be a much more practical source of energy for you. Or microhydro if you have a site for it. 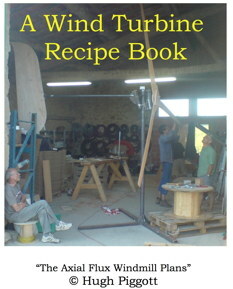 The recipe book has a clear description of a coil winder that you can build. It’s not the only way to do it. Anyone can think up their own coil winder design but this is a simple one that you can build that works. Is it possible to buy the recipe book from Sweden? I’ve searched the site, but didn’t find info about how to buy the book. My Recipe Book provides a fully detailed specification of all the parts you need and also has some suggested suppliers. A lot depends on where you live. But if you want 5kW in a 10 knot wind you are probably dreaming. Your turbine would need to be about 35 feet in diameter. I’m impressed with your book. Having read from cover to cover & given that I have experience in Vacuum pressing airfoil structures (F3B gliders a decade ago). I’m keen to develop a 2.4M diameter design, Carbon Skinned over blue foam with Shear spar. I wonder if you might share your more recent thinking over airfoils? Assuming 200mm root chord, 50mm tip. Any thoughts on profiles, angle of attack at root and tip? I am not an airfoil buff. You’d want something with a good lift/drag ratio (always) and also not too prone to stalling. The angle of the blade is not the same as the angle of attack and I am pretty happy with the blade angles as specified but I admit that I am a bit hand-to-mouth in my approach. I am generally more concerned with reliability than getting the absolute maximum efficiency since reliability is the most important feature in a small wind turbine. So make your composite blades strong please. The stresses at the root due to gyro forces in yaw can impose very high fatigue loads. Wood is ideal for withstanding these loads.